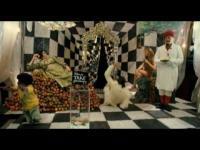 The Imaginarium of Doctor Parnassus is a fantastical morality tale, set in the present-day. It tells the story of Dr. Parnassus and his extraordinary Imaginarium, a travelling show where members of the audience get an irresistible opportunity to choose between light and joy or darkness and gloom. Valentina is now rapidly approaching this coming of age milestone and Dr. Parnassus is desperate to protect her from her impending fate. Mr. Nick arrives to collect but, always keen to make a bet, renegotiates the wager. Now the winner of Valentina will be determined by whoever seduces the first five souls. Enlisting a series of wild, comical and compelling characters in his journey, Dr. Parnassus promises his daughters hand in marriage to the man that helps him win. In London, the sideshow troupe of Doctor Parnassus promises the audience a journey to the "Imaginarium", an imaginary world commanded by the mind of Doctor Parnassus, where dreams come true. In the stories that Doctor Parnassus tells to his daughter Valentina, the midget Percy, and his assistant Anton, he claims to have lived for more than one thousand years; However, when he fell in love with a mortal woman, he made a deal with the devil (Mr. Nick), trading his immortality for youth. As part of the bargain, he promised his son or daughter to Mr. Nick on their sixteenth birthday. Valentina is now almost to the doomed age and Doctor Parnassus makes a new bet with Mr. Nick, whoever seduces five souls in the Imaginarium will have Valentina as a prize. Meanwhile the troupe rescues Tony, a young man that was hanged on a bridge by the Russians. Tony was chased until he finds and joins the group. Tony and Valentina fall in love with each other and the jealous Anton discovers that his competition may be a liar.